Last Sunday I was lucky enough to be out for a stroll in absolutely perfect weather. This season is ideal for me - a respite from the cold and no hint yet of the mosquitoes that plague me in the summer. Almost every Chelsea gallery was closed because it was Easter. All but one: the New York outpost of Galleria Ca’ D’Oro, an Italian gallery. 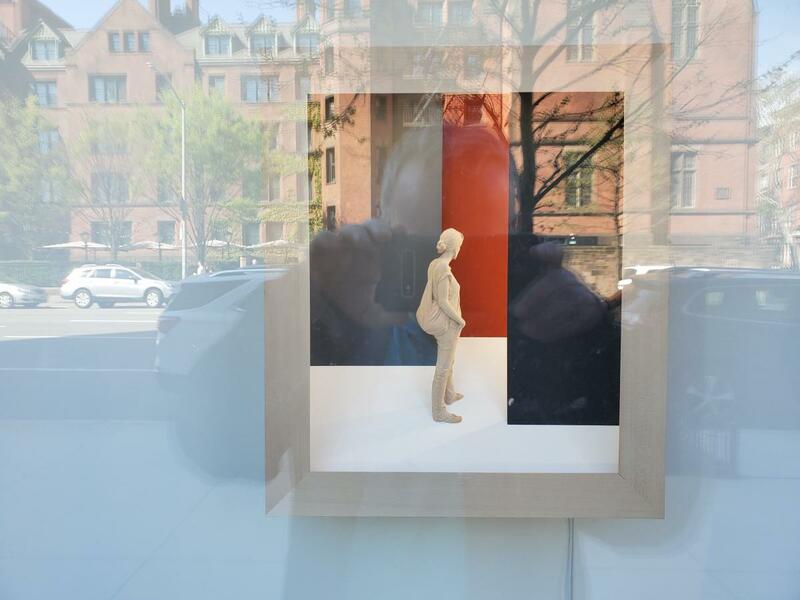 The gallery’s window had a tiny figurine made by an artist new to me: Peter Demetz. 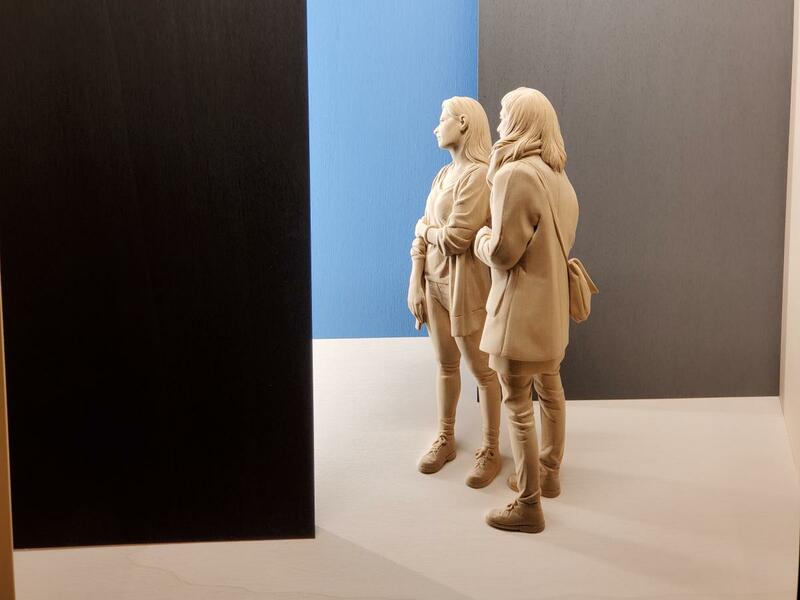 Each window of the show had a figurine or two figurines faced away from the viewer. Despite facing away, the tiny sculptures nevertheless were deeply expressive. A sag of the shoulders; a swaggering stance; the spaces between two people marking intimacy or its absence -- all drew in the viewer, making me wonder about these people: who were they? What were their stories? Amazingly, Demetz managed without any facial expressions or eye contact, normally our biggest lures for other human beings, to draw me in. 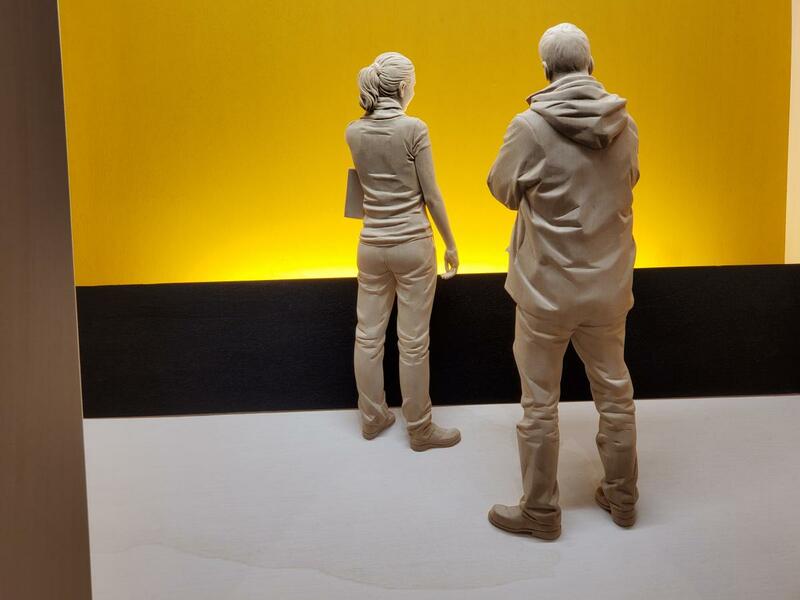 The sculptures are about 9" tall and carved from linden wood, painted white and installed in wooden boxes. The carvings are foreshortened to exaggerate the depth of the boxes (which aren't very deep). The figures appear very modern - one could easily imagine a ponytailed young woman reaching for her iPhone and texting a friend - but also as beatifically and timelessly still as a madonna. When I left the show I realized that a few years ago I had praised the artistry of another Italian sculptor with the name Demetz - Gehard Demetz. You can read about him here. The scale and content of both artists are totally different, but there is a obvious commonality in carving skill and training. Surely these two classically trained sculptors expressing themselves in wood were related - perhaps brothers or cousins? A check with both Galleria Ca’ D’Oro and Jack Shainman, which represents Gehard Demetz, revealed the answer was no. According to Gloria Porcella of Galleria Ca’ D’Oro, the two are not related but do know each other. The name is simply very common in Northern Italy. I hope each Demetz becomes better known here. Here you get a sense of scale of how small the figures really are.